Two years ago, Odonata (dragonflies and damselflies – I’ll use the term dragonflies collectively) began distracting me a little from my long-standing love, butterflies. 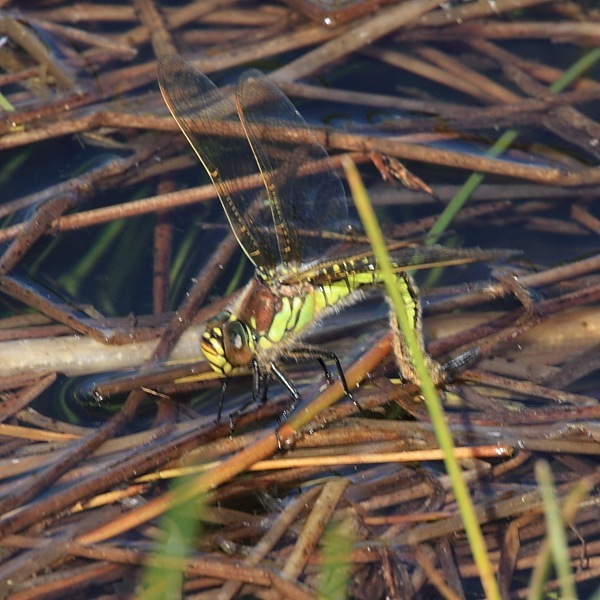 Last year I became very keen on dragonflies and started searching them out when we went travelling. This year I was waiting with bated breath for the start of the season after what seemed like a very long winter. As soon as the dragonflies were out, so was I, looking for them. As a relative newbie to dragonflies, I now realize that the start of a particular species’ flight season (they vary quite markedly) really is the best time to snap it. 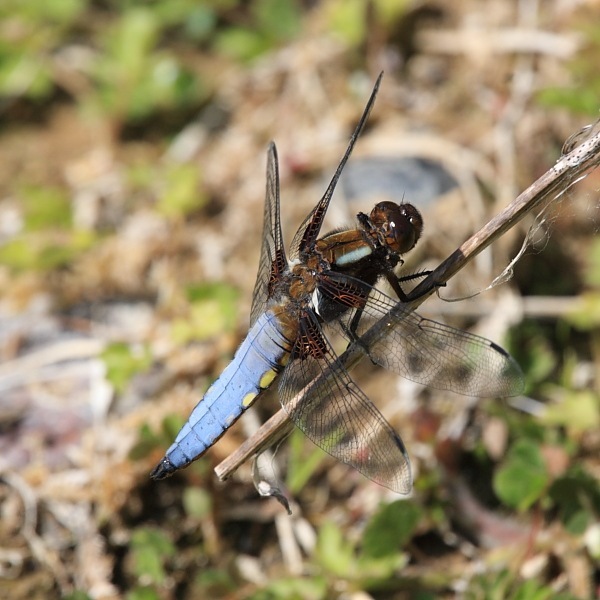 Firstly, a freshly emerged dragonfly (teneral) is more likely to be in pristine condition and secondly, you get to see the sometimes stark colour variation between an immature and a mature adult. This is particularly marked in the two examples here. 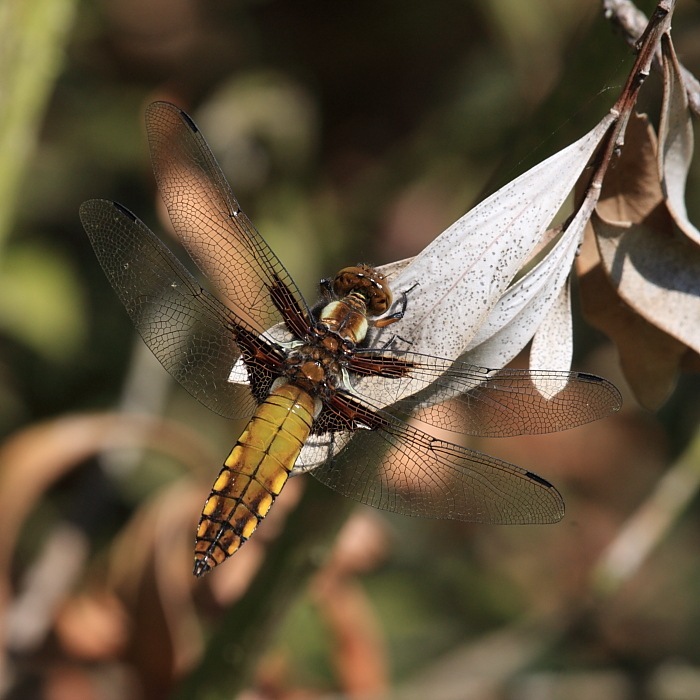 Both these photographs are of very clean male Broad-bodied Chasers (Libellula depressa), though they don’t seem to resemble each other that much. As the adult male matures, it develops a blue pruinescence which covers the body. On the far left is an immature male from our recent trip to Suffolk. On the near left is a very neat mature male from Ledburn Pit yesterday. Being in a well known sand-producing area, we are pretty much surrounded by various quarries/pits that are no longer worked. Nature, with the help of a little management, has been allowed to take over, and very welcome it is, too. There is even a former tar-macadam plant from the days of building the M1 motorway. The plant was razed and that site is also being reclaimed by nature. What is essentially industrial wasteland may not, at first, seem like a likely hunting ground for perfection in nature but first impressions are wrong. It certainly beats tidy parkland where, though wildlife is normally there to be seen, the nature enthusiast is required to contend with people walking dogs (and normally failing either to control them or to clean up behind them), fishermen (generally leaving their beer cans behind) and swarms of Satan’s Little Disciples scaring things away. 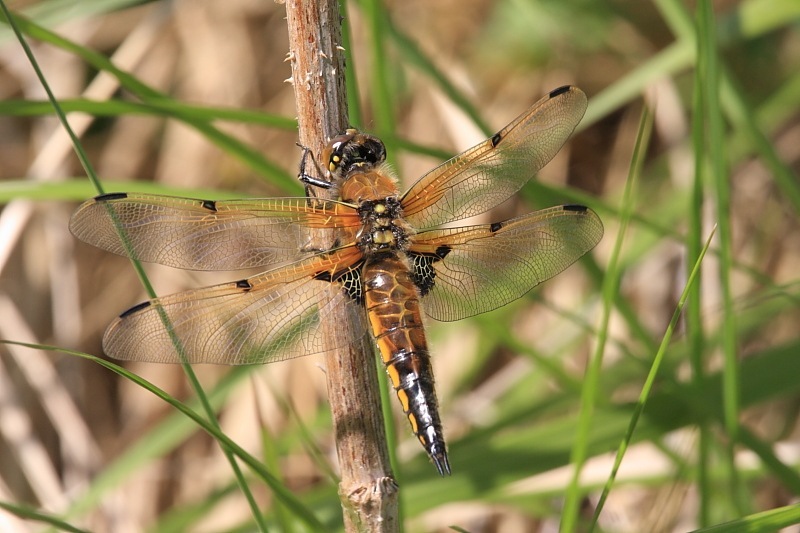 My mature male Broad-bodied Chaser wasn’t my only success at Ledburn Pit yesterday. 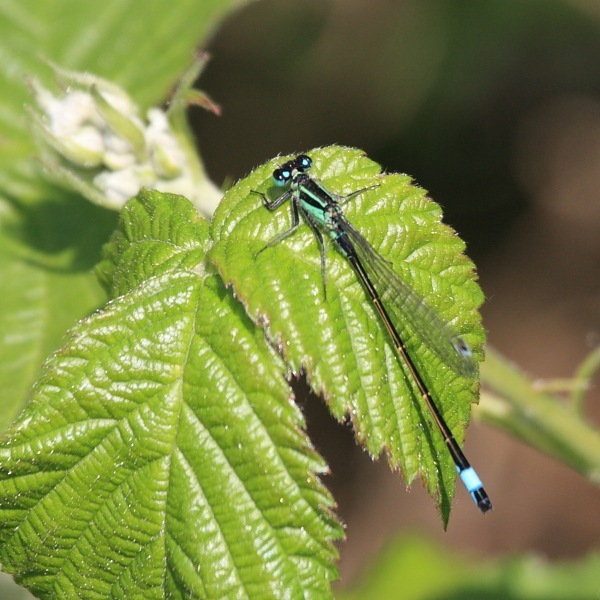 We (I’d bumped into Rory Morrisey again) started off with a relatively new Red-eyed Damselfy (Erythromma najas) and Blue-tailed Damselfly (Ischnura elegans), both flitting about a bed of nettles and both of which eventually cooperated with our cameras. 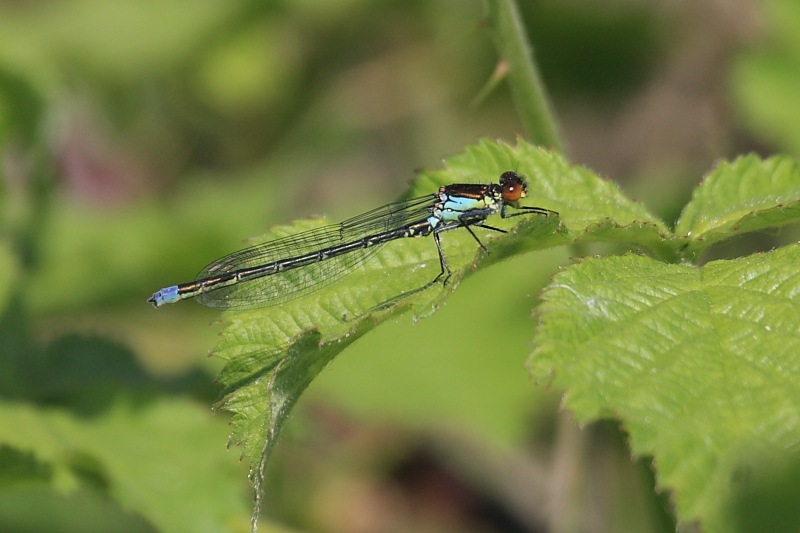 The Red-eyed Damselfly (near right) doesn’t yet have the intensity of colour in its eyes that would be expected in an older specimen. We soon met a third member of our clan (Bob Henry) and so an enthusiasm of naturalists was once again formed. It was Bob who led us to a small pool where at least three male Broad-bodied Chasers seemed to be harrying a lone female. Nothing changes! Industrial Wasteland is great – just us and the critters. Stunning pics! Are these taken with your new ‘scope’ John? What sort of distance are you from the subjects? Thank you very much, Alan. Nice to know efforts are reaching an appreciative audience. This is my all-purpose wildlife lens, a Canon 100-400mm f4.5-5.6 L IS lens (a.k.a. TheBeast). Its closest focus distance au naturel is 1.8m (~6ft), which is OK for larger dragonflies, but I generally use it with a 32mm close-focus ring that gets me to within about 1.25m/4ft which works well for the smaller damselflies, too. A combination of stealth (practice, practice, practice) and luck gets me working typically at those distances. This blog may have disheartened Steve. He now says, when we’re on our Naturetrek trip, we’ll just leave identification to the experts…. At least he’s got the right lens & possibly the correct rings! Amazing stuff, I’m jealous. I’ve only got a little point ‘n shoot Nikon at the moment, and get camera shake even just using that!